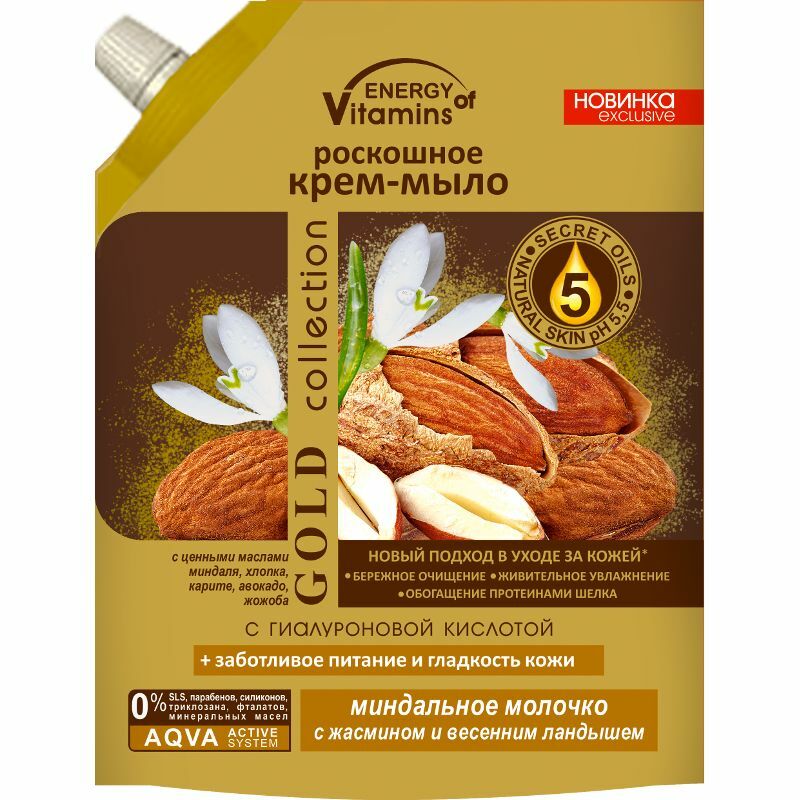 Almond Milk, Jasmine & Lily of the Valley Luxurious Creamy Soap is produced by Ukrainian beauty brand Energy of Vitamins for its exclusive GOLD collection. It is an innovative skincare product formulated with five carrier oils, hyaluronic acid and hydrolysed silk protein. The soap provides delicate cleansing and active moisturising, nourishes the skin and makes it smoother. This luxurious creamy soap with a pearly texture very delicately removes dirt, grime, excess sebum and dead skin cells thanks to its mild formula based on Aqua Active (a unique skin hydration system), five valuable oils, silk protein and almond milk. Jasmine and lily of the valley extracts give the soap a light floral scent that will transform your daily skincare routine into a real spa ritual. Almond milk, almond oil and cotton seed oil contained in the soap provide moisturising and nourishment, make the skin look healthy and glowing. Shea (karite) butter, jojoba oil and avocado oil enhance the skin’s natural protective functions and maintain its natural elasticity and firmness. Aqua Active complex (hyaluronic acid and active ingredient Hydrovance) helps to maintain the skin’s hydro-lipid balance and prevents dehydration. Thanks to active ingredients, the soap has a very mild cleansing effect, provides delicate care of all skin types, and keeps the skin feeling clean and fresh throughout the day, which makes it perfect for daily use. Free of SLS, parabens, silicones, triclosan, phthalates, mineral oil. Suitable for sensitive skin. Value pack. Directions. Unscrew the cap of the plastic bag and pour the contents into a bottle. Apply a small amount of soap to damp skin, lather, massage, rinse. Can be used as a shower gel. For external use only. Ingredients. Aqua, Sodium Laureth Sulfate, Sodium Chloride, Cocamide DEA, Glycol Distearate (and) Laureth-4 (and) Cocamidopropyl Betaine; PEG-40 Hydrogenated Castor Oil; PEG-7 Glyceryl Cocoate, Glycerin, Styrene / Acrylates Copolymer (and) Coco-Glucoside; Jasmine Еssential Еxtract, Convallaria Flower Extract, Hydrolyzed Milk Protein, Hydrolyzed Silk Protein, Parfum, Hydrogenated Avocado Oil, Hydrogenated Jojoba Oil, Hydrogenated Shea Butter, Hydrogenated Gossypium Herbaceum (Cotton) Seed Oil, Hydrogenated Almond Oil, Sodium Hyaluronate, Hydroxyethyl Urea, Methylchloroisothiazolinone, Methylisothiazolinone; Citric Acid, EDTA. Want to buy Almond Milk, Jasmine & Lily of the Valley Luxurious Creamy Soap? Call us or submit your order via our web site!